It is helpful to think of the Earth as being composed of various large, intricate systems that interact with each other in a manner that keeps things in balance (and, as a result, makes it possible for humans and other organisms to survive on the Earth). Check Your Thinking: Do you know the names of any of those large Earth systems? This is where it is handy to know a little bit of Latin or Greek. By the way, several research studies have shown that high school science textbooks typically include more unfamiliar (foreign) words than do high school foreign language textbooks. Is that crazy, or what! When students learn, for example, the Spanish word for house (casa), they are learning a new name for a concept that they already understand. But in science, the unfamiliar words (such as photosynthesis) typically represent unfamiliar, abstract concepts. Most science textbooks overwhelm students with too much non-essential terminology. As a teacher, it’s important to know that K-12 students do not need to memorize or understand all the terminology found in typical science textbooks. The National Research Council’s “A Framework for K-12 Science Education: Practices, Crosscutting Concepts, and Core Ideas” guides the developing Next Generation Science Standards. The Next Generation Science Standards require teachers to facilitate authentic scientific experiments with their students. The snow module ensures cross-cutting concepts in science are explored and incorporates math skills throughout. You can help your students understand what they read in science textbooks if you assist them to memorize some of the Latin and Greek roots that are commonly used as parts of English words. These root words are used a lot in science. Memorizing root words will make it much easier for students to figure out the meanings of long scientific terms (such as photosynthesis, from the Greek words “photo” meaning “light” and “synthesis” meaning “putting together” or “composition”) when they encounter them in text. This reduces the amount of new information they have to learn as they read science text. In fact, many scientific terms are composed of several root words, making it possible for students to guess the meanings of many terms with a high degree of accuracy. We have identified some of the major Earth systems: atmosphere, lithosphere, biosphere, hydrosphere. Now, let’s break down the terminology to define these terms. Here we go! Check Your Thinking: What does “sphere” mean? What do atmo-, litho-, bio-, hydro- and cryo- mean? What is the make-up of the hydrosphere? What is the make-up of the biosphere? What is the make-up of the lithosphere? What is the make-up of the atmosphere? What is the make-up of the air? What is the make-up of the cryosphere? Figure 5.8: This graphic shows major Earth systems and touches upon the interrelationship between those systems. 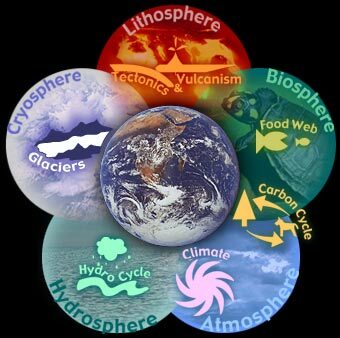 There are other scientific terms for other parts of the Earth’s systems (e.g., asthenosphere), but these five systems (atmosphere, lithosphere, biosphere, hydrosphere, cryosphere) are directly observable, and they effect life at the Earth’s surface. We are not going to worry about the names for the various parts of the atmosphere (e.g., stratosphere) or systems that are well below the surface. Download the Latin & Greek Root Words for Science document (pdf) for a list of root words from Latin and Greek that would be useful for students to memorize.